Maysville, MO…….Jarod Michael Pullen, 16, of Maysville, Mo., went to be with the Lord on Thursday morning, July 19, 2018 @ the Cameron Hospital. Funeral service will be held @ Maysville H.S. Football field, Maysville Mo. on Wednesday July 25, @ 1 pm., with Pastor Joel Mitchell of Oak Christian Church officiating. Christian burial will follow at Oak Lawn Cemetery. Jarod was born in St. Joseph, Mo., to Glen E. and Jonna A. (Pullen) Riley on September 16, 2001. He went to School in Maysville, having completed his sophomore year. Jarod was a Wolverine football player. He lived for sports! He is survived by his loving parents: Glen and Jonna, siblings: Athena and Ean, grandparents: Robin Pullen, Ed (Reta) Riley, John (Hali) Pullen, great grandparents: Barbara Korneman, Gary Gibson, Glen (Joyce) Riley, aunts: Kathy (Jay) Bryant, Rian Andres,Dani Andres, Jennifer (Lee) Pullen, Amanda (Zach) Gilmore, Candace (Duane) Stinley, uncles: Jeremy Pullen, Dean Wiglesworth, and best friend: Jake Bryant as well as many other relatives and a multitude of friends. Jarod was preceded in death by his grandma: Vicki Cole and grandad: Larry Korneman. He loved to travel, especially to Mt. Rushmore, Virginia Beach, and his trip to NYC and Boston, where he attended the National Academy of Future Physicians and Medical Scientists. Jarod loved spending time with friends and family, the ocean, and meeting new people from around the world. He received many awards from the weight room and the football team. He was the most proud of pushing himself to be better and received so much joy and pleasure in being Wolverine Nation’s # 65. Memorial donations may be made to: The Pullen/Riley family in care of Turner Family Funeral Home, Maysville, Mo. 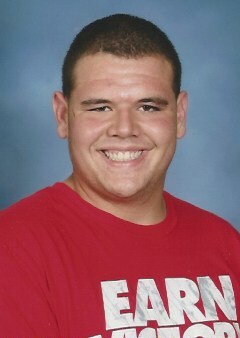 May God Bless Jarod as he is layed to rest today. He was a wonderfull young man full of life and ambition. He was never without a smile and a friend to everyone. May God give his family some peace and comfort.